The below tutorial helps explain the code-behind model and project structure of pages built within VS 2005 Web Application Projects. Please make sure that you have already completed Tutorial 1: Building Your First Web Application Project before reviewing this one. ASP.NET does the work of wiring up a reference from this code-behind field declaration to point to the declared control in the .aspx file at runtime. Developers can then program directly against this control within their code-behind file. 1) VS 2003 is adding/deleting code in the same file where the developer is authoring their own code -- and accidental conflicts/mistakes do end up happening (for example: some code that the developer writes can sometimes get modified or deleted by VS). The tool-generated hidden block above is also a little "messy" for some people's tastes. 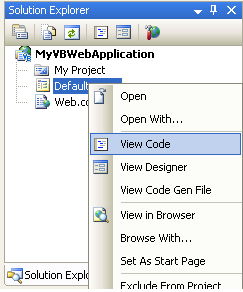 2) The control-declarations are only updated when a developer using VS 2003 activates the WYSIWYG page designer. If a developer is only using the source-editor to customize the page, they will not get control updates, and will instead have to add these control declarations manually (which is a pain). What is different between VS 2003 and VS 2005 is that Visual Studio no longer injects its tool-specific wire-up code in the developer's code-behind file. Instead, it takes advantage of a new language feature in C# and VB called "partial types" (or partial classes) to split the code-behind implementation across two files. One of these partial class files is the developer-owned code-behind file that contains developer-written event-handlers and code for the page. The other partial class file is then a tool-generated/maintained file that contains the protected control field declarations and the other design-time code that Visual Studio requires. The benefit of splitting them out into two separate files at design-time is that it ensures that the code that VS creates and maintains never interferes (or deletes) code that a developer writes. At compile-time, these files are compiled together and generate a single code-behind class. This will compile clean and run just fine -- because the "Label1" and "Calendar1" field references have been defined within the default.aspx.designer.vb file. 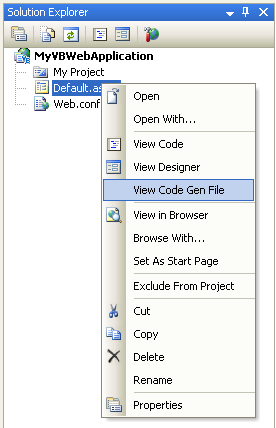 When you do a build inside a VS 2005 Web Application project, all pages, user-controls, master pages (and their associated code-behind files+design-time generated files), along with all other standalone classes within the project are compiled into a single assembly. This is the same behavior as with VS 2003.